Hey guys! Do you like original art? 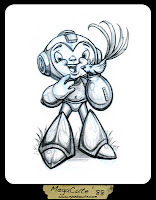 How about original Mega Man art?! Well, I wanted to announce a little raffle of sorts that I'll be conducting to launch my new Facebook page! That's right, you can now follow my work on Facebook if you're so inclined. Head on over and check it out! I'll be posting more frequently there then I do here. Little sketches, works in progress, contests, things that have grabbed my interest, etc. If you'd like more updates about my art then that's your best bet. I'm looking forward for more ways to connect with artists and those who just love art! So head on over and like the page to follow all of my updates in your feed! And thanks in advance for checking it out! 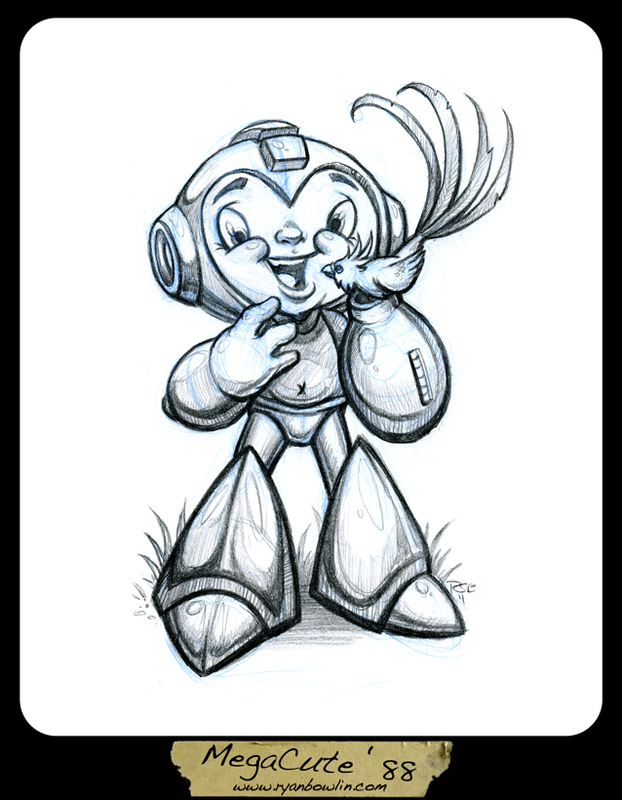 As I mentioned earlier, I'm going to do a drawing for the original pencil sketch that I created for my "MegaCute" illustration. On top of that I'm also going to include a limited edition "Hellboy" print for the lucky winner! How do you enter to win this drawing? Simple. Like the fan page to become apart of the community and then share the page with your friends on Facebook via your news feed/wall. I'll make note of who has shared the page (even those who already have shared will be entered to win) and will randomly select a winner next Wednesday evening (12/7/11)! Thanks a ton in advance for supporting my work and for getting the word out! And good luck! It's that time of the year again! The weather is starting to cool down, my video game consoles are overflowing with awesome titles to play and that sense of child like wonder is starting to fill up within me! There's something about the late fall/winter that really brings out the kid in me. I'm sure the holidays have a lot to do with that but I really love the seasons as well. I've been living in Vegas for almost three years now and I have to admit that I've become a bit spoiled with our mild, "eternal fall." But there's nothing like breathing in that still, cool scent of winter. And I often sit in my apartment pining for the times we'd watch the snow fall out the window near the fire at my parent's home. However there are plenty of things I don't miss about my midwestern home during the winter time. It is quite nice not to have to carve my car out of ice every morning. Ha! At any rate, like many, this is my favorite time of the year. 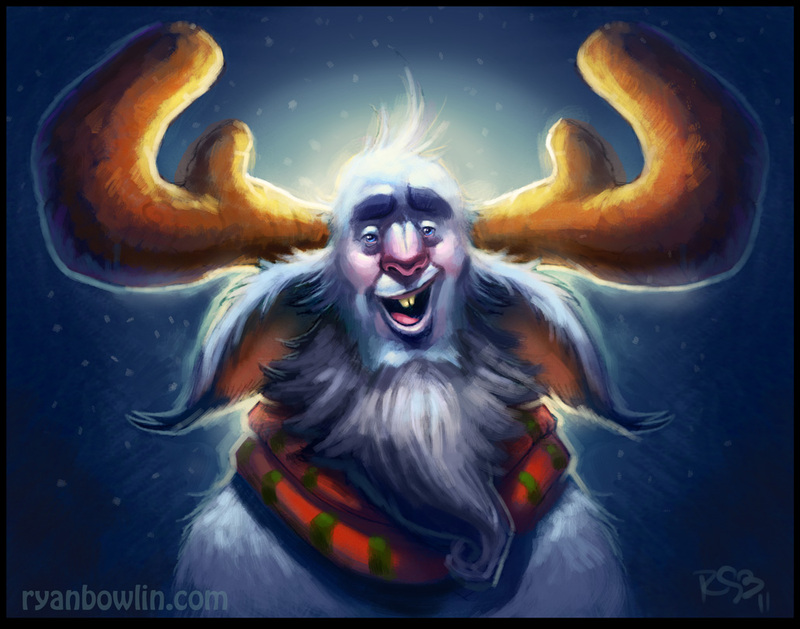 And this year I thought I might do a "holiday" themed illustration for the heck of it. This idea was generated from my desire to draw a little kid with a big cuddly monster. Simple enough! Nothing says Christmas like some monsters, right?! 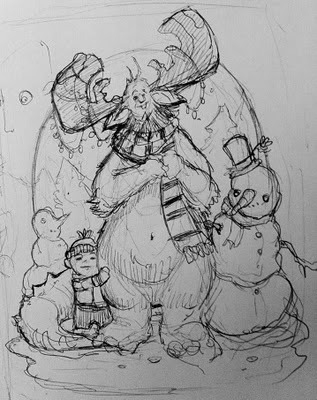 Throw in some snow, Christmas lights and some snow men and you've got a holiday themed image! And that's where the initial thumbnail that you see above came from. I shared it on Facebook and received some positive feedback so I've decided to move forward with it. Hope you guys like where Hans and his pal are heading! I'll be plugging away at it over the next couple weeks and will share more when I get the chance! Thanks again for checking it out and I hope you all are enjoying the holiday season! Take care! - SKYRIM!!! I'm already like 23 hours into it and am seriously adoring the sense of exploration. I could live in that world! - The Legend of Zelda: Skyward Sword soundtrack. I've been listening a ton while working and cannot wait for Santa to drop this on me at Christmas! The "staff credits rolling" track is amazery. - I recently stumbled upon this European band, Amiina, and I'm in love with their music. So simple and haunting. I can't believe I've lived this long without them! Here's another one of those blasted ogre heads! 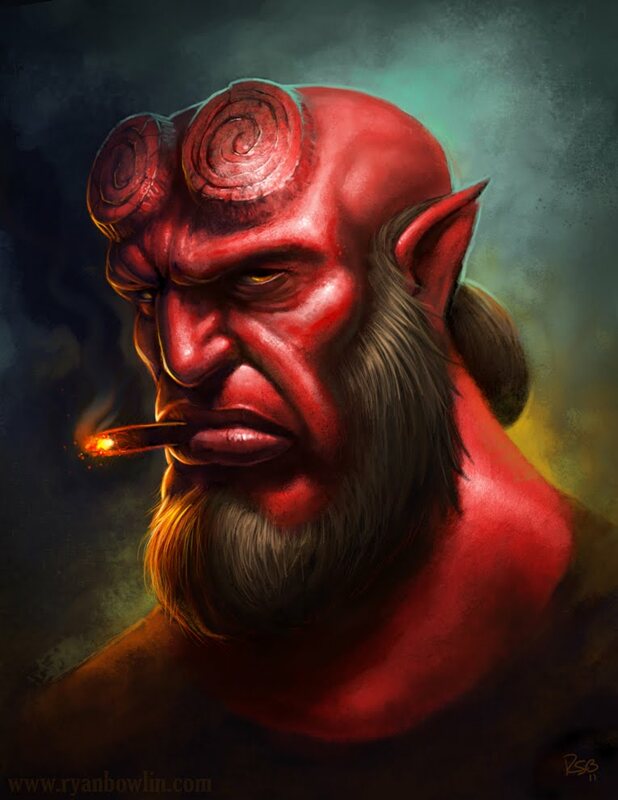 This was a quick scribble for my friend Aron who recently purchased one of my Hellboy prints. I've been doing these quick little sketches as an extra thank you to those who have been supporting my work. I completely lost my posting habits this month but I've been busy with plenty of art related things. And I'd be lying if I didn't note that I've been indulging in a lot of the new video game releases as well. Ha! I get to pretend to be Batman! C'mon, who can fault me for that?! ;o) I'll make sure to have a more proper update in the weeks to come. Hope you're all enjoying the start of the fall season! I know I am! Take care and thanks again for stopping in.